If you’d told me 15 years ago that my favorite vegetable would be brussel sprouts, and I’d be making recipes called chili brussel sprouts, I would have told you you were nuts. Growing up, I never really liked vegetables. I was a somewhat overweight tomboy that enjoyed lots of playing, but also enjoyed lots of cereal. We’re talking whopping, tremendous, oversized bowls of cereal. I ate cereal out of serving bowls, or things that should have been serving bowls. A box of cereal would last me 2-3 servings, 4 if I was being conservative. My favorites? Fruity Pebbles, Crunch Berries, and a mix of half Honey Nut Cheerios and half Kix. I don’t even want to think about the amount of sugar I was consuming, not to mention the pink and purple milk at the end that I drank out of the bowl (the best part!) Gross. But, here we are. Now I read ingredient labels on everything I buy, grocery shopping involves multiple stores, farmer’s markets, and direct sourcing from locals, and I make things like chili brussel sprouts. Never say never. 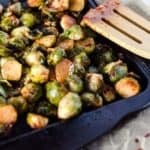 My go-to preparation for sprouts is with balsamic vinegar – you can see my quick and easy method for roasting sprouts here. But, I was feeling something a little different this time. Instead of that salty vinegar taste, I wanted sprouts with a kick. And here you have them. 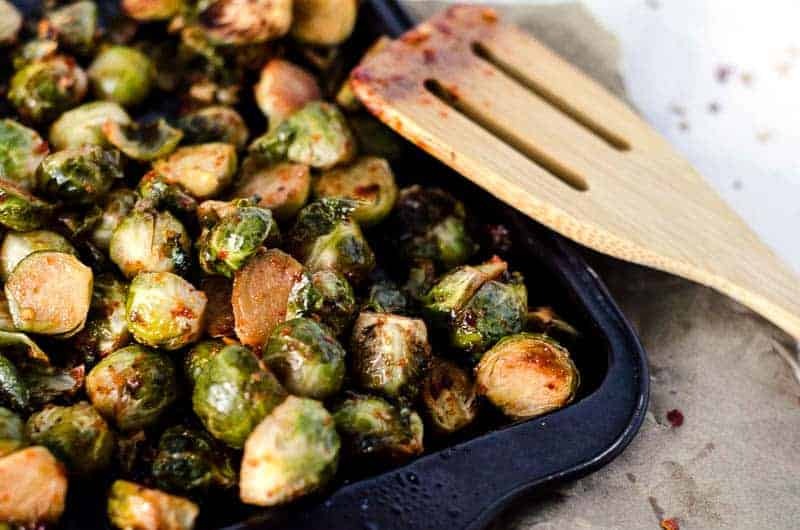 Chili brussel sprouts. Don’t let the spice intimidate you – its not overwhelming, just a good strong hint of flavor. Pair them with some roasted chicken, or as a side to some burgers, or with some cauli rice. They’re just an easy side dish to whip up, and they can really pair with next to anything. 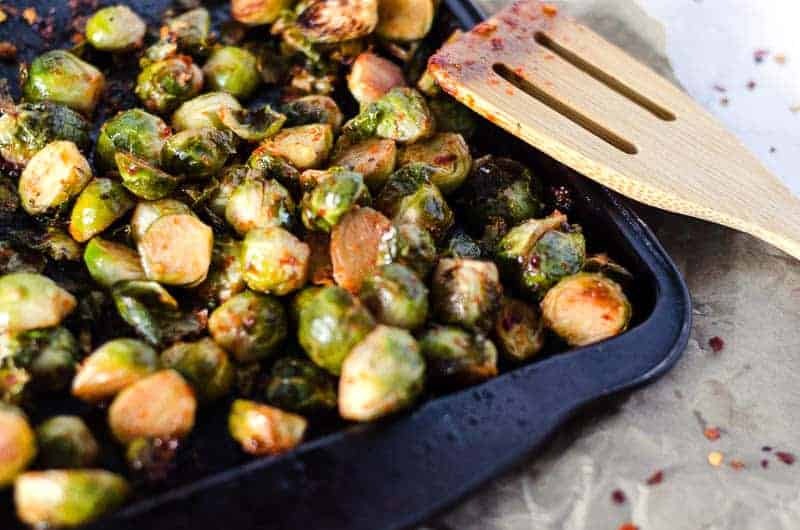 And even if you’re not a brussel sprout person, you could use the sauce recipe on any vegetable and roast it. Ohhh I bet it would be extra tasty on some diced sweet potatoes! Totally trying that next. Just don’t put it on your cereal. 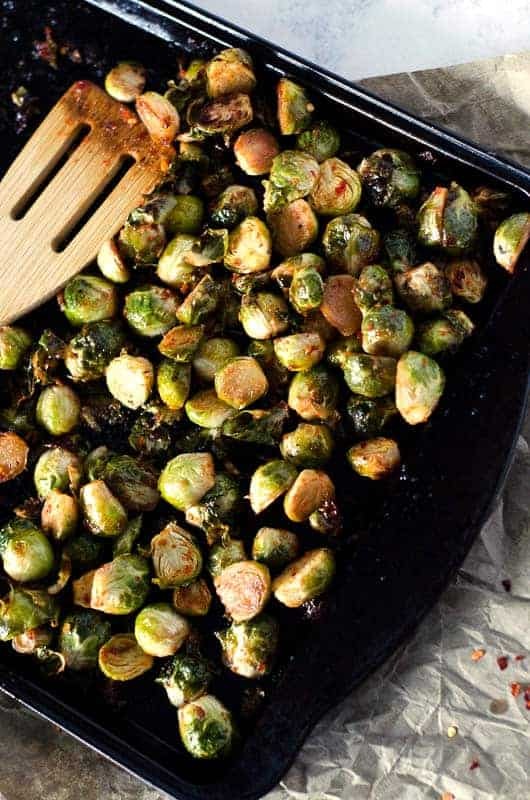 Combine all ingredients except brussel sprouts in a small bowl and whisk until smooth. 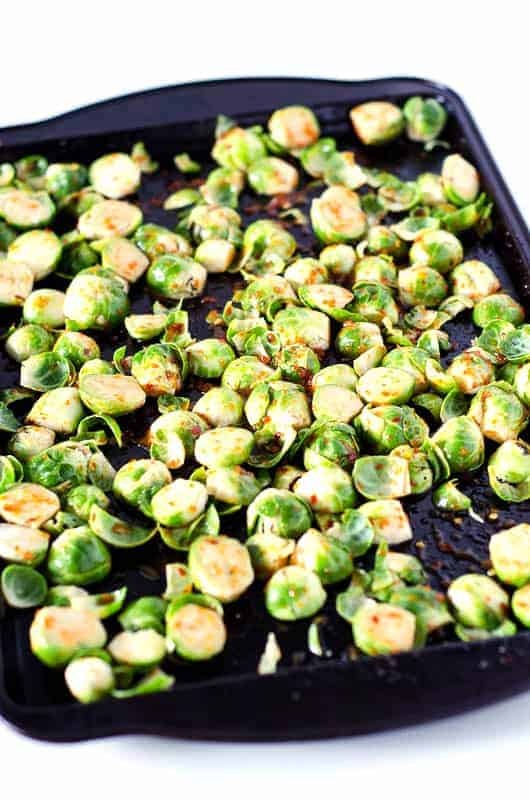 Spread out trimmed sprouts on a baking sheet. 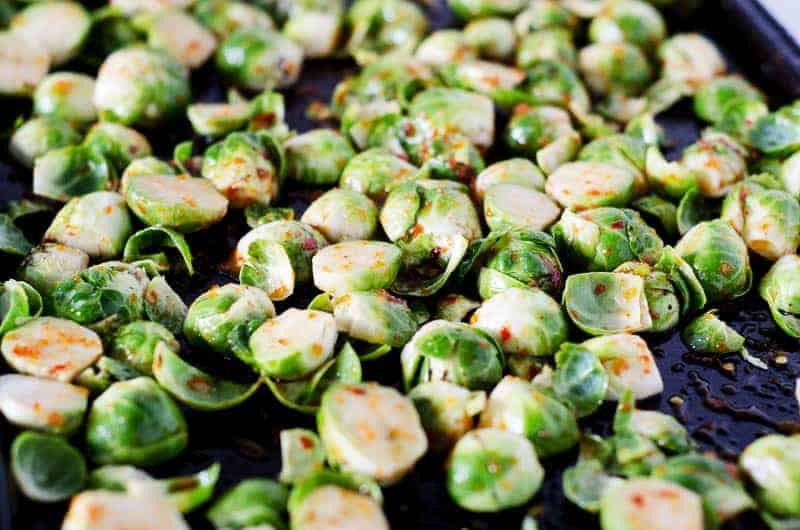 Pour sauce over sprouts and toss to coat. 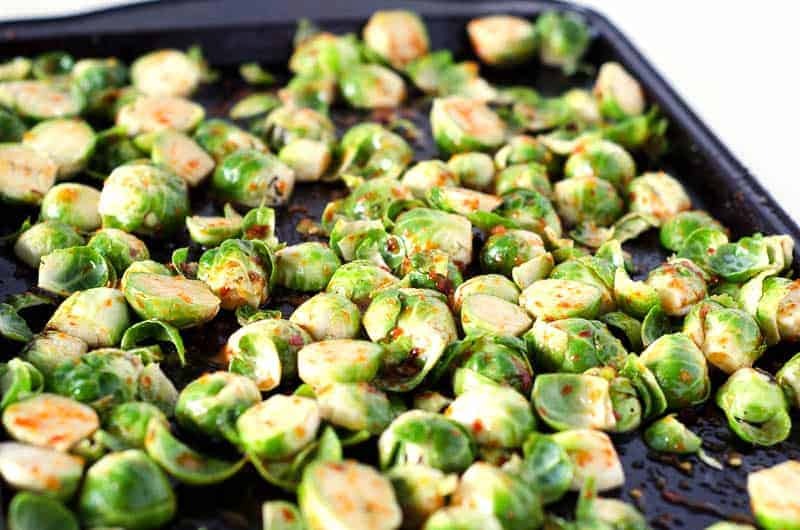 Roast sprouts in preheated oven for 10 minutes, toss, then roast for 5-10 minutes more until desired level of doneness is reached. If they're looking dry, add a splash more of avocado oil!